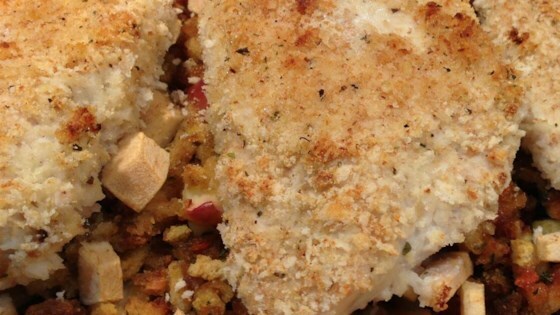 "Breaded chicken breasts are baked with a simple apple and bread stuffing for an easy one dish meal. Get cozy with this holiday-inspired meal anytime of year!" Pour the milk into a shallow bowl. In a separate bowl, whisk together the eggs and water. Place the bread crumbs in a shallow dish or on a plate. Dip the chicken breast halves into the milk, then into the egg, then press into the bread crumbs to coat. Place on a plate, and set aside. Prepare the stuffing mix according to the package directions, but substituting apple juice for the water. When bringing the juice and butter to a boil, add the diced apple with peel to the pan. Stir in the stuffing mix until the liquid is absorbed. Transfer the stuffing to a baking dish, and top with the pieces of the remaining apple. Place the chicken breasts on top of the stuffing, and cover with aluminum foil. Bake for 45 to 50 minutes, or until the chicken juices run clear. This stuffing blends sausage, turkey liver, fruits, and veggies. This was a wonderful recipe. Instead of chicken I followed the reciepe using pork chops and added sliced breakfast sausage. This meal was delicious. It was really easy to make and tasted great too. I made it for my whole family and everyone loved it!